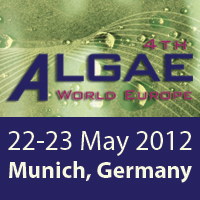 Algae Industry Experts Share on Projects, Technology and Developments at 4th Algae World Europe - 22-23 May, 2012! The promising opportunities and future of Algae industry will be the highlights at the 4th Algae World Europe conference in Munich. The 1.5 day event is to take place on 22-23 May 2012 and hosted by Centre for Management Technology, a global conference organizer based in Singapore. 4th Algae World Europe with its comprehensive overview is well placed to serve as a platform to promote knowledge exchange and valuable networking in an apt and conducive setting. The algae industry has been propelled onto the world stage with the use of microalgae as an alternative biofuel feedstock, gaining renewed interest from entrepreneurs, researchers, scientists and corporations around the world. Hundreds of millions of dollars have been pumped towards the race to harness the maximum potential of algae biofuel and turn algae into a commercially viable energy source. Other than biofuels, algae is also touted as valuable feedstock in industries such as nutrition, pharmaceutical, cosmetics, including animal and aquaculture feed. Its roles in carbon capture and wastewater treatment have also gained massive interest from players in cement, water and power. The promising opportunities and future of Algae industry are the highlights at the 4th Algae World Europe conference in Munich, hosted by Centre for Management Technology, a global conference organizer based in Singapore. To take place on 22-23 May, 2012, the 1.5 day event features expert speakers from the industry’s top major players including Lux Research, Icos Capital Management BV, Ingrepro BV, Photonz Corporation, Wageningen University and Research Centre, University of Florence, GMB GmbH, AlgaeStream SA, Toeps, Feyecon, The Finnish Environment Institute, Technische Universität München, Pall Corporation (HQ), The University of Sheffield, Fraunhofer Institute, Novasep Process SAS and University College London. The 2012 edition of the highly successful series expects to once again attract over 200 Project Owners, Technology Developers, Cleantech Entrepreneurs, Research Institutes, Aquaculturists, Financiers and Investors, Heavy Industries including Mining Companies, Power Plant Operators, Cement Plant Operators, Biofuels Network, Animal Feed Companies, Nutraceuticals /Pharmaceutical companies, Fertilizer suppliers, Aircraft/Engine Manufacturers, Technology suppliers for Downstream processing, Water Treatment & Waste Water Professionals to participate. While Algae's potential is undisputed, its commercialization will dictate the future directions for the industry. 4th Algae World Europe with its comprehensive overview is well placed to serve as a platform to promote knowledge exchange and valuable networking in an apt and conducive setting.